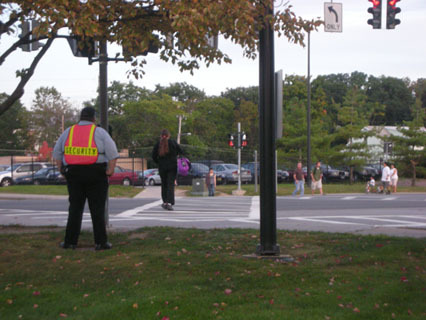 A student crossing the street breathes a sigh of relief as she sees S.N.A.P. employee Darren Polsky keeping a watchful eye on the perilous Marist grounds. Darren Polsky, a S.N.A.P worker at Marist College, is excited to go home and relax after a tough two hours in the cabaret. When Polsky took his first steps into the Cabaret–immediately commanding the respect and awe-struck gazes of his peers–nothing could have prepared him for the grueling shift spent eating chicken tenders and protecting students from the dangers that lurk in the shadows. Polsky believes S.N.A.P. has made him and his co-heroes better people. The constant threat of imminent death and the wide variety of milkshake options in Cabaret’s F’Real machine have made him appreciate every breath he takes in this life. Polsky went on to say that if he had a wife and kids to come home to, he would tell them he loves them every day, so long as he continues to make it out alive from countless nights spent answering the helpless cries of students in crisis. In fact, the precarious nature of the job is precisely what keeps Polsky coming back. “You get addicted to the adrenaline…that feeling of knowing that the lives of every student at Marist are in your hands,” he says, adding that the thrill of facing the menacing ghouls that haunt the campus when night falls makes putting your feet up and throwing on the game after work so much more satisfying. Despite his pride for the dangerous job, Polsky admits that he can hardly wait to kick back and crack open a beer after a hard two hours’ work upholding the law and watching an open mic night performance. March 31, 2015 in On-Campus.